It’s not on the same level of overall popularity as Facebook and Instagram, but Pinterest, which is moving closer to launching its initial public offering, has released some updated usage stats, which show that it now has 265 million monthly active users, up from the 250 million that it reported back in September. 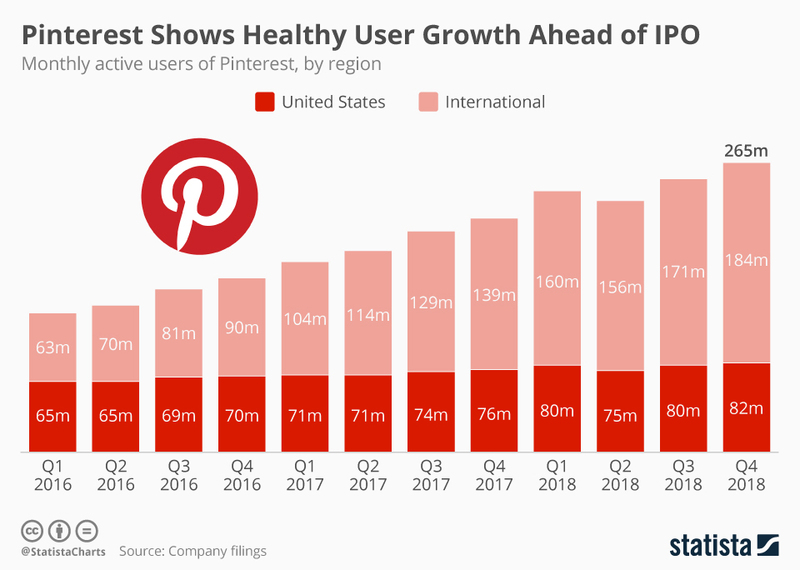 The numbers were released as part of Pinterest’s S1 filing ahead of its IPO – and as noted by Statista, while Pinterest’s user count isn’t as big as other social platforms (which Pinterest has repeatedly said it is not), the platform does have a demonstrated record of steady, ongoing growth. As we’ve noted several times in the past, Pinterest presents significant, and growing opportunities for brands looking to reach consumers in a shopping mindset, and the data here supports that once again – while it may not offer the scale and potential reach of other social networks, Pinterest could actually offer more actionable, beneficial potential due to the way in which consumers use the platform to find products, specifically. Indeed, Pinterest says that 90% of weekly Pinners use the app to make purchase decisions, while 78% of Pinners say content from brands on the platform is helpful. Add to this Pinterest’s advancing systems for product recommendations based on image recognition, and its evolving tools for facilitating on-platform purchases, and you can see why Pinterest has chosen now as the time to go public. It may not be the most significant platform on your digital marketing radar, but the stats here are worth considering. Maybe you should open up your Pinterest app and have a look at what’s on offer from brands within your niche or sector, and see how they’re utilizing the platform. Following its unpopular redesign, Snapchat has been struggling to gain users in the US. As a result, eMarketer has significantly downgraded its growth outlook for Snapchat in its latest US social usage forecast. For the first time, Snapchat will lose monthly US users this year, with growth expected to flatten in 2020. Facebook has announced that it will remove its Ad Relevance Score as part of a broader switch to more granular, relevant ad metrics to help improve performance. Facebook originally launched its ad relevance score back in 2015 to provide advertisers with more insight into their ad performance, and what they could expect. Snap investors, avert your eyes! It’s been exactly two years since Snap completed its very successful IPO. Snap had figured out how to reach the young people that Facebook was no longer capturing; investors hoped Snapchat would give Facebook and its stable of apps like Instagram and Messenger some legitimate competition. Unfortunately for Snap, that hasn’t happened. In two years, the stock is down about 60 percent from the $24.50 price it closed at on its first day of public trading. It’s not a pretty slide. New estimates from eMarketer show that US advertisers will spend more than $129 billion on digital advertising in 2019 — more than the $109 billion they plan to spend on “traditional” advertising. Snap finally had a good day. You might even call it a great day. That’s because, after a tough year in which Snap execs and investors watched the company’s stock price slowly bleed out because of government investigations, executive departures, and product issues, Snap reported better-than-expected earnings on Tuesday that shot the stock up more than 22 percent in after-hours trading. The main reason: Snap’s business last quarter was stronger than anyone thought. Sales were up to a record $390 million, a 36 percent jump over the same quarter a year ago. And Snap is slowly moving toward profitability, a goal that CEO Evan Spiegel shared internally with Snap employees last year. Sports has always been a key element of our interactive process, a means to connect and engage over a common interest and participate in related events. Given this, it’s no surprise to see that sport also plays a significant role in how people engage on social platforms, and that can be a valuable consideration for brands looking for ways to increase brand awareness and connection with their fans. In line with this, and in the lead-up to the 2019 Super Bowl, Facebook has published a new report which looks at how social media has changed the way people engage with sports content, and what brands need to consider in this shift. Facebook utilized the GlobalWebIndex “Sports Around the World” study, which surveyed over 90,000 internet users, in order to extract relevant insights about how digital consumers engage with sports.